There's only about 15 minutes of trivia in each show. The rest is unfunny chat. Some of the hosts are OK, but the main one, Jonathan, is annoying and a sore loser. They recently put 1/2 of their free content behind a paywall; easy unsub. If you dont believe in supporting the hard work of content creators then you dont deserve to listen to the exclusive episodes anyway. This podcast is entirely self-produced without the backing of a big corporation like Wondery or Gimlet. Now that they require a payment for the past catalog and weekly episodes (note: biweekly episodes are still free), I decreased my rating from 4 to 2. The benefit of paying before was a chance to join the quiz and contribute questions. Now you have to pay to get regular content, and that's a trend I don't support in podcasting. Carmela, Jonathan and Chris are joined this week by Nick Brooks for a fantastically fun game. Enjoy! TW212: Did You Say Poop Again? In celebration of Women's History Month we are proud to bring you our 2019 All Women's Episode! Join Carmela as she hosts a great game featuring the team of Lauren Carey and Lisa Wolfisch going up against the team of Katie Sekelsky and Toni Rask. Enjoy! Blinkist - Go to www.blinkist.com/twa to start your 7-day free trial! Hello Fresh - Go to www.hellofresh.com/twa80 to save $80 on your first box! I'm excited to bring you this week's game. It was originally recorded as a bonus episode but it got promoted to the main feed and I'm sure you'll enjoy it. This week Rob Cotter hosts a 2018 year in review game featuring David Livasy, Stacey McPeek, Lindsey Henry, and Rob Worman! Sponsored by - www.takecareof.com - Use promo code twa50 to get 50% off of your first month! We've reached the conclusion of our 4 week tournament to introduce Trivial Warfare Blitz. Our competitors have each gone through a tough match to get here and this one is for all the marbles. It's game 3 of our 4 episode tournament introducing Trivial Warfare Blitz! We have one more spot in the week 4 championship. See who will be victorious between Beth Asbury, Andrew Brown, and Robert Dimitri. We're joined this week by the team of Madeleine Garvey, Trey Thomas and Susie Becker who team up against Jonathan are Carmela with Trivia Hall of Famer Paul Paquet in the host's chair. This week's show features the exclusive reveal of this year's finalists for the Trivial Hall of Fame. The inductees will be revealed in August at the Trivia Nationals! Check out these great sponsors using these links and be use to use the promo codes mentioned in the show to take advantage of the discounts you get as a Trivial Warfare listener! It's game 2 of our 4 episode tournament introducing the concept of Trivial Warfare Blitz! This week we're joined by Nick Groves, Addy Lewis, and Caitlin Joyce! This is the first of a 4 show bonus tournament with a completely different format than our standard game. TW Blitz is a variation of TW focused on direct competition, speed, and pressure. This week we are joined by Wesley Wells, Cheyenne Fletcher, and Tim Edwards. General Nick Groves from District Trivia joins us as a guest host for this week's show. The team of Josh Wennrich, Nick Weingartner and Erika Johnson team up against Jonathan and Carmela this week. Enjoy! We're kicking off the Black History Month festivities a little bit early this year with our 3rd annual BHM episode. This week Ben is in the host's chair while returning champions Jennifer Wright and Kantaad Svendsgaard take on newcomers Kenya Hitchens and Greg Johnson. This is one of my favorite episodes each year. Enjoy! We have a great game for you today. Jonathan and Chris team up against Matty Kimberlin and Tim Hilliard with Ben asking the questions. Enjoy! We have so much fun doing the milestone episodes like this one. Scott Barber is back in the house to reprise his roll as the host from TW100 and we're going to see just exactly what we've actually learned in the 2 years since episode 100. Chris, Ben, Carmela and Jonathan are all in the house and everyone is high energy. I'm going to warn you now about driving while listening to round 6. If you think crying with laughter will make it hard to drive then consider yourself forewarned. Thank you to everyone who has been with us for so many episodes and welcome to all of you new listeners who have recently discovered us. You've got a hell of a ride in front of you. TW198 features Jonathan teaming up with guest John Finn in studio taking on the team of Kate Hadley and Matt Chesnut. Enjoy! We are thrilled to be joined this week by the hosts of Miss Information - Lauren Tagliaferro and Julia Novakovic! These awesome ladies will be taking on Jonathan in a show vs. show matchup with Carmela hosting. Good luck trying to keep a straight face this week. TW196 is sponsored by Hello Fresh. Get $60 now by signing up at www.hellofresh.com/twa60 and using the promo code twa60. We're joined this week by Gary Middleton and David Livasy! David teams up with Chris against Gary with Jonathan asking the questions. Enjoy! Babbel = www.Babbel.com and use the promo code TWA to get 50% off your first 3 months! Green Chef = www.GreenChef.us/TWA get $50 off of your first box from Green Chef! We are joined this week by Colby Burnett, Pam Mueller, and Alan Lin! These three are joining forces early next year in the upcoming Jeopardy Team Tournament. But before that we had a chance to pit them against each other in a triple threat match! Colby is a former Teachers Tournament and Tournament of Champions winner. Pam is a former College Tournament Winner and Battle of Decades Semifinalist. Alan is the most recent player and was a Tournament of Champions just last year. Enjoy! We're sponsored this week by www.Babbel.com. Be sure to use the promo code TWA for 50% off your first 3 months. We're sponsored this week by www.HelloFresh.com/TWA60. be sure to use the promocode twa60. We're back on the main feed with a great three on one contest where Chris teams with guests Nicholas Groves and Liz Weeks to take on Jonathan with Ben in the hosts chair. This week's show is sponsored by Babbel - www.Babbel.com and by Green Chef - www.greenchef.us/TWA. Did you miss last week's show? You can find it on our exclusive officers feed along with our whole archive. Just go to www.trivialwarfarearmy.com and sign up as a lieutenant or above! This week's episode was a night time recording, and you all know there's always something in the air when we record at night. You're going to enjoy this one. It's Chris and Kierah Leach vs. Jonathan with Ben Hosting. Have fun! Babble - Try Babble for FREE at www.Babbel.com or download the app! Hello Fresh - Get $60 off your first 3 boxes by going to www.hellofresh.com/TWA60 and using the promo code TWA60. Super fun game this week. We're joined by Steve Muehl and Justin Wharff who team up with Carmela against Jonathan in a 3 on 1 with Chris holding down the hosting duties. Enjoy! This week starts off with a bang as we give away $250 in our Best Trivia Question contest! At the midpoint Jonathan announces a giveaway for folks who are signing up or increasing their support of the show after hearing his big announcement earlier this month. And on top of that we have an awesome game with Jonathan taking on Lydia Hellwig and Bryan Brensinger with Carmela hosting. Enjoy! 5:15 - $250 Trivia Question Contest! Fantastic episode for you this week. It's the return of the OG Host Marc Demeter! He's asking asking the questions to the teams of Colonel Joe Magee teaming up with Carmela against Jonathan and Ben. Enjoy! We are excited to be joined this week by newly minted Trivia Hall of Famer Paul Paquet. He teams up with Ben to go up against Chris and Jonathan with Carmela in the host's chair. Enjoy! Jonathan talks about the future of the show and a massive change to the business model coming up in October. This week we're joined by the one and only Matthew Stephens. Are we able to convince him to perform a live intro to Warm it up Chris? You'll have to listen to find out! It's Carmela and Matthew vs. Jonathan and Chris with Ben hosting. Enjoy! This week's recording was done live in Richmond Virginia! I'm joined by Erin Barclay, John Welch, Kat Thompson and Jonathan Robbins for a super fun game. It's Erin & John vs. Kat and Robbins with Oakes hosting! This week's show is sponsored by www.GreenChef.us/TWA. Today's show features Jeffrey Seguritan, Drew Buxbaum, Stephen Vedder, and Gentleman Jim all representing the great state of New Jersey. Today's show is sponsored by www.watercoolertrivia.com! This week we are joined in studio by the father and daughter pairing of Tom and Megan Casserlie. They team up and go head to head against Jonathan with Ben in the host's chair. Enjoy! It's time to get artsy fartsy in the best sense of the phrase. This week's show is an All Art Bonus that has been promoted to the main feed. It features contestants Dustin Resch, Tara Whittle and Jeffrey Seguritan each of whom puts on an impressive display of knowledge about the world of art. The host and author of today's game is Nolan Werner! Enjoy! We're joined this week for the first time by the Founder and President of Team Chris, Pate Hogan! He teams up with Chris to take on Jonathan in a 2 on one showdown with Carmela asking the questions. Enjoy! This week's episode is was an absolute blast to record. Even though we had technical difficulties it couldn't damper spirit of fun and humor that ran throughout the recording. We are joined this week by guests Kat Thompson, Trey Thomas and Will Dennison. It's the three of them against Chris and Jonathan with Trish back in the hosts chair. Enjoy! This week's show is sponsored by www.WaterCoolerTrivia.com! We're joined this week by the trio of Markkus Ellis, Josh Mullan and Brad Doyle who team up to take on Jonathan with Chris hosting. Enjoy! This week's show marks the last show recorded in the apartment where Trivial Warfare started and grew into what it is today. In today's game we have Chris and Carmela teaming up against Rob Cotter and Todd Gianelloni with Jonathan manning the host's chair. Enjoy! This week's show is sponsored by Hello Fresh. Go to www.hellofresh.com/TWA30 and use the code TWA30 to get $30 off your first box! Chris and Jonathan are joined this week by guests Nick John and Allen Brown. Jonathan is going back to his old ways playing a solo player against Chris and Allen with Nick taking over host duties. This week we have a fun and fast moving game for you. It's a 2 on 1 with Jonathan taking on the team of Tim Beggs and Rich Flegel with Ben in the host's chair. Enjoy! Big Episode this week! We've got Carmela and Jonathan going up against David Livasy, Matt Chesnut and Anna Piper with Jeremy Cahnmann joining us as a special guest host! We are sponsored this week by HIMS. Check out www.forhims.com/trivial to learn more! TW170: Is It Just Me, or...? We're joined this week by Colonel Chris Hayth who teams up with Carmela to go up against Jonathan with big Ben in the hosts chair. This week's episode is sponsored by Hello Fresh. Get $30 off your first week by going to www.hellofresh.com/twa30 and use the promo code twa30. 9:56 - Warm it Up Chris! This week Jonathan and Carmela team up again our guests Mary Randazzo and Drew Grant. Lots of laughs this week as Ben puts the teams through their paces. Enjoy! We have so much awesome for you in today's episode. Ben is in rare form as he joins forces with guests Marcus & Asha against Jonathan with Carmela hosting. Today's show is brought to you by www.watercoolertrivia.com. This week's show features Ken, Matt, Neal and Jeff from Triviality, AJ Mass from Beat My Guest, and Andy Saunders from Complete the List. Andy has been a TW supporter for a long time now and it was great to meet AJ and the Triviality crew in Boston earlier this year. I have had the idea for a big trivia podcast crossover brewing for a while but meeting everybody and getting to each other was the thing that pushed it over the top. As Triviality, Beat My Guest and Complete the List have grown over the last year I've been excited about the expansion of our little niche. Each show has found it's audience and goes about things a little bit differently. I knew I wanted to highlight that when we did our first big crossover event. So that's exactly what we did. Today's game features 4 different mini-games. Each one is a modified version of one of the podcasts represented. Each show will be competing with the others across the different formats to crown a winner of the first ever Trivialympics. Today's show is sponsored by Hims. Go to www.forhims.com/trivial to get a full month of hair loss prevention for just $5! We are joined in house this week by special guest Dustin Resch. It's a fabulous episode this week where Chris is the host and Carmela and Dustin team up against Ben and Jonathan. This one is so good that our patrons are going to get a special set of After Dark outtakes on Thursday that were too funny to edit out completely. Dustin also contributed this week's show art. I'm in LOVE with it! This week's show is sponsored by HelloFresh! Head over to www.hellofresh.com/twa30 and use the promo code twa30 to get $30 off of your first box! We are joined this week by the team in the great white north. Ashley and Eric Sutherland team up against Jonathan while Carmela hosts. We have a great time together in this episode that seems to fly by. Enjoy! We have a full house this week. Ben, Carmela, Jonathan, and Chris are all here and we're welcoming our special guest host Mike Sleeper who came to visit us from Augusta, Georgia. The teams are Ben and Jonathan vs. Carmela and Chris as Mike puts us through our paces. Enjoy! We have a great show for you this week. Ben and Carmela are in the house and we welcome in our guests April Calvarro and Andrew Thomas! Carmela teams up with April to take on Jonathan and Ben and Andrew got to try his hand at hosting. I think you'll agree that he did a fabulous job. This week's show is sponsored by Hims. Check out www.ForHims.com/trivial for a full month trial for only 5 bucks! We have the whole gang in house for the second week in a row. Ben takes another turn in the host's chair while Chris and Carmela team up against Jonathan and special guest teammate Brent Bollmeier. Enjoy! 00:00 - Intro - We make a hash of some sidekicks, Rambo does Rambo things and we introduce our guess Brent Bollmeier! 04:06 - WIUC - From Natalie Anderson asks us to name the city that different TV shows are set in. We've got a full house this week with Ben hosting and Chris and Carmela teaming up against Jonathan and guest teammate Erika Johnson. Ton of fun today, hope you all enjoy it. 0:00 Intro - Chris talks about his recent cruise and then gets mad at Jonathan & Ben for teasing him. 10:55 Warm It Up Chris - City or Cheese? This week we are sponsored by www.watercoolertrivia.com and www.hellofresh.com. We're joined this week by the inimitable Billy Webb who joins us from Indiana. He teams up with Carmela against Jonathan in a 2 on 1 match. Oh by the way, CHRIS is BACK and he's sitting in the host's chair! Back by popular request, this is our second All-Wrestling bonus episode! Today's game is hosted by Derick Schroeppel from The Oversell Podcast and features a triple threat match between Ben, Chris and Jonathan! Enjoy! TW156: Who Run the World? This week we're thrilled to present our first ever All-Woman episode in celebration of Woman's History Month. Carmela Smith, the first lady of Trivial Warfare, is in the host's chair this week. In house we have the team of Trish Leighton and Caro... I mean Lauren Carey. They are competing against the team of Katie Sekelsky and Caitlin Joyce. Enjoy! You guys are in for a treat this week. We're joined this week by Jeopardy alums Sabrina Fritz and Sally Neumann in this weeks episode. I can say without reservation that this episode has already jumped into my top five. I think you're going to love it. It's Chris and Jonathan vs. Sabrina and Sally with Ben hosting. We are thrilled to be joined this week by The Real Weird Sisters for a Harry Potter Trivia Challenge episode! Alice and Martha are legitimate Harry Potter experts and you can find them at http://www.realweirdsisters.com/. This week we pair up Chris and Carmela on team RavenPuff and pit them against team SlytherDor made up of Daniel and Jennifer Richardson and team GriffinClaw made up of Alice and Martha. Can the experts hold their ground or will one of our house teams pull off the upset? Enjoy! Support us by taking advantage of our deal with our sponsor Audible at www.audibletrial.com/TWA! OR support us by signing up for a Lootcrate subscription at www.lootcrate.com/TWA One last way you can support us is by joining the Trivial Warfare Army at www.patreon.com/TWA By the way, if you're not a member of our Facebook Group at https://www.facebook.com/groups/TrivialWarfareArmy/ then you are really missing out! Today's contestants have been on a collision course since February. That's right, it's the prize fight you've been waiting for. Our 2016 Listener Tournament Champion Russ Friedewald goes head to head against Chris and Jonathan in a triple threat match. Does he have what it takes to be the king of the mountain or is he wearing a crown of fools gold? Marc hosts as we discover the answer. As if that weren't enough this week features what might be the funniest moment in show history. No joke! Last note - we've opened a patreon page for listeners who are interested in supporting the show financially. You can check it out at www.patreon.com/TWA. We take a break from our listener tournament this week to enjoy a great episode featuring Bryan and Nathan Orr. We're also glad to welcome Ben Young back into the hosts chair. All in all this is one of our funniest episodes ever. Be sure to tune back in next week to catch up on the Listener Tournament. We have 3 shows to go before the championship! Josh and Joel from Always Listening stopped by the Trivial Warfare studios this week with one thing on their mind - settling once and for all who knew more useless crap. It's the hopeless optimist vs. a ruthless sandbagger and one of them is gonna get murdelated! This episode could not be more fun. Need More? Today we discover that Delaware is still a state and discuss whether or not Rhode Island is getting too big for its britches. Enjoy! Jonathan's been on an unprecedented winning streak, winning every show he's played for over two months. Is this the week that Chris can break the streak. Also, find out what question made Jonathan so mad that he had to walk away from the microphone to cool off. Enjoy this and more on this week's episode of Trivial Warfare! Thanks for joining us for another episode of Trivial Warfare! This week we welcome our friend Ben to the show. He steps in to host and does a great job while managing to sound like Barry White. This week we learn Ponce de Leon's first name, get a blast from the past with a question about WKRP and get a double dose of Shakespeare. Be sure to step by www.trivialwarfare.com for this week's show notes. You'll find classic clips from Ally McBeal and Friday along with fun scenes from the Simpsons and Major league. While you're there you can get our new Android App and sign up to be a Warhead! This week we introduce our friend Carmela on the show. She's stepping in to do some guest hosting for us and at the same time to "bring a little class to the joint," as Chris would say. Speaking of Chris, be sure to listen for his epic meltdown near the end of the show. It's a thing of beauty. 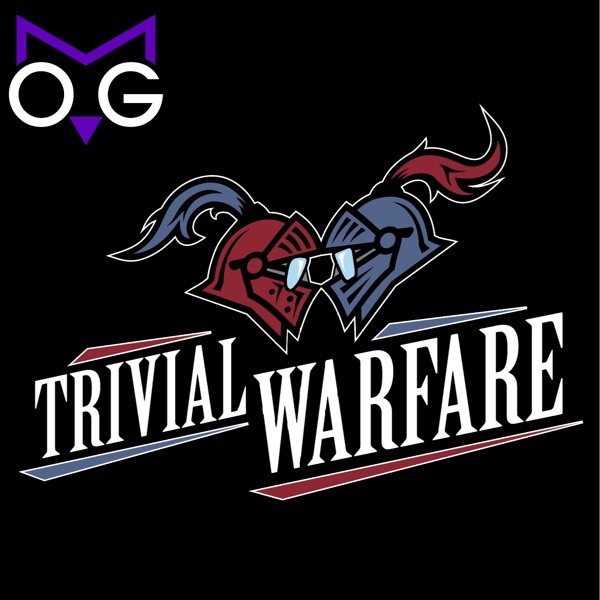 Don't forget to head over to www.trivialwarfare.com and sign up for the Trivial Warfare Army to get in on the show news for insiders. This week's show notes will be a little late but they should be up by mid-week. Don't fret, I'm working on them. I just didn't get a chance to get them done early this week with my Canadian excursion. Thanks for checking out our show! If you love trivia you’ll love the show. If you love laughing you’ll love the show. If you love people making fools of themselves you’ll love the show. If you’re breathing you’ll love the show. I think that just about covers it. We jump right into it in Episode 12 with a question about Family Ties that is one of the funniest things we’ve ever done. At least, it’s funny to me. During the editing process I kept going back to listen to it because it was guaranteed to bring a smile to my face. Hope you guys love it as much as we do. Reach out to us at trivialwarfare@gmail.com and let us know what you think. Episode 1 was a ton of fun to make. Of course, it wasn't our first try. It was actually our third try to start this thing. I still have the old files. Maybe some day I'll brush them off and share them. Anyway, I think that we were both on top of our game here, not necessarily in terms of knowing all of the answers, but definitely in terms of having fun. We were both in a good mood and it showed. I think my favorite moment was when I realized that I received a question about James Cook directly after answering a question about James Kirk. That was a complete accident which is why it was brilliant.